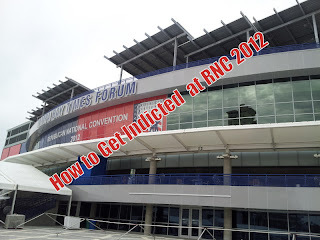 Tampa Criminal Defense Attorney has been researching how to get indicted in Tampa Florida during the Republican National Convention (RNC) in Tampa, Florida. How do you get indicted for protesting? Violate a little known law that became effective in March 2012, the Federal Restricted Buildings and Grounds Improvement Act of 2011. The Federal Restricted Buildings and Grounds Improvement Act of 2011, 18 U.S.C. § 1752 (2012), is essentially an anti-trespassing statute that covers locations subject to heightened Secret Service security measures. Special thanks to our confidential source for helping with the legal research. I have already discussed the new law with a couple of Assistant United States Attorneys in the Middle District of Florida - Tampa Division. Violate the new Federal Trespassing Statute - What Type of Conduct is Prohibited by § 1752? Knowingly engaging in any act of physical violence against any person or property in any restricted building or grounds; or attempting or conspiring to do so. Section 1752 applies at locations where individuals under Secret Service protection are temporarily located, and/or at a major event designated as a National Special Security Event. §§ 1752(c)(1)(A)–(C). Restricted buildings or grounds are any posted, cordoned off, or otherwise restricted area of a building or grounds so restricted in conjunction with an event designated as a special event of national significance. § 1752(c)(1)(C).2 This includes the Republican National Convention (RNC) held this year in Tampa, Florida. What are the penalties for violating § 1752? Penalties for violating § 1752 include, in most cases, fine and/or imprisonment for up to one year, § 1752(b)(2), or fine and/or imprisonment for up to 10 years if the person, during and in relation to the offense, uses or carries a deadly or dangerous weapon or firearm; or the offense results in significant bodily injury. § 1752(b)(1)(A)&(B). How Can § 1752 Be Used (or Misused) During the RNC? Although § 1752 is not intended to limit peaceful demonstrations or protests, as a practical matter, § 1752 has potential to stifle free speech. To be sure, § 1752 does not create any new crimes. Rather, the statute amends the 2006 version of 18 U.S.C. § 1752. As amended, however, § 1752 makes it easier to arrest and prosecute lawful protesters. First, the amended version of § 1752 lowers the mens rea requirement that prosecutors must prove from proving that a violation was committed “willfully and knowingly” to merely proving that it was committed “knowingly.” Compare § 1752(a)(1)–(4) (2012), with 18 U.S.C. § 1752(a)(1)–(4) (2006). This is a significant change. Under a willfully and knowingly” standard, you have to know your conduct is unlawful to violate the statute. See United States v. Bursey, 416 F.3d 301, 308 (4th Cir. 2005) (holding that to have acted willfully under § 1752, a defendant must have “acted with knowledge that his conduct was unlawful.”) (internal citations omitted). But a “knowing” standard merely requires that you “act knowingly” to commit a crime. Thus, a person will be guilty of a crime if that person “knows” he/she is in a restricted area, even though that person had no intention to break the law. Second, § 1752 gives law enforcement broad authority to determine when otherwise lawful protest becomes criminal. For instance, § 1752(a)(2) prohibits “disorderly or disruptive conduct,” without bothering to define what exactly is “disorderly” or “disruptive.” The same is true for whether a protester is “within such proximity to” a “Government business or official functions.” Law enforcement will presumably decide whether a protester is too loud or too close for comfort. What are the defenses available?